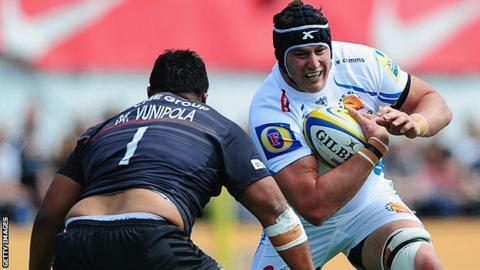 Exeter Chiefs lock Mitch Lees is set to miss about four months after having an operation on a bicep injury. The Australia-born forward, 27, had been touted as a possible England player, with Chiefs head coach Rob Baxter having discussed him with new national team boss Eddie Jones. "Mitch is going to be out long-term," Baxter told the club website. "It is a blow but any team in the Premiership has to be able to weather these things and get on with it." Earlier this month, Baxter said it was unlikely that the club would bring in an extra second row to cover Lees' injury, which he picked up on New Year's Day. Meanwhile, scrum-half Will Chudley, meanwhile, is unlikely to train this week after suffering minor ankle ligament damage. Baxter hopes, however, that wing Jack Nowell's knee injury is "relatively short-term", allowing him to play for England in the Six Nations.